Providence Homes’ is excited to announce the Normandy French Country Inventory Home on Lot 21 in Wellwood Preserve at Durbin Crossing will be ready for move-in on December 20th! This 4,308 sq ft, award-winning design, located at 156 Wellwood Avenue, is set on a lakefront home site in a cul-de-sac. The Lot 21 Normandy French Country offers flexibility for a variety of families, with 5 bedrooms, 3.5 baths, formal areas, a study, a first floor game room, a private family loft, and a 3-car garage. The first floor features a spacious owners suite, a family room with dramatic 20’ ceilings, and a gourmet kitchen and café for all to enjoy. The interior appointments are exceptional. Even better? This home will be 100% ENERGY STAR® Certified. Wellwood Preserve at Durbin Crossing is located within the very desirable St Johns County school district and is only minutes from 1-95. Durbin Crossing is consistently one of the top selling communities in the area, and is a must see location for anyone interested in living in St Johns County. For additional information stop by our furnished Normandy Model Home in Durbin Crossing at 1801 Duthie Park Court or contact Melissa Matthews at 904-337-5236. 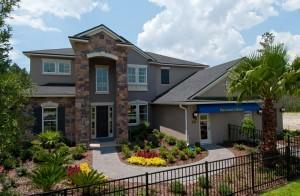 Providence Homes has built more than 2,500 homes for families’ right here in Jacksonville, Florida. As one of the area’s largest locally owned homebuilders, we are committed to building beautifully designed, 100% ENERGY STAR® certified homes at an affordable price. Providence Homes has been a name families can trust for more than 20 years.